Choose the Right Audio, Video, and Home Theater Setup to Elevate Your Home Entertainment Experience! While the term "Audio/Video" means something different to just about everybody, Telesis Electronics uses this category to encompass the realm of whole-house distributed sound and visual communications. In essence, putting the ability to see and hear what you want - where and when you want it. This capability, while easy to understand, presents a myriad of challenges based on the technologies involved. Telesis knows the problems and knows how to overcome them. The best time to think about your new home audio video solutions is well in advance of building a new home. If you're in the process of designing and building a custom home, Telesis can work with you and your architect to design the technology into your home before the first shovel of dirt gets moved. If your home is already complete, don't worry. Telesis can retrofit homes with audio and video components to bring your house into the 21st century! Distributed audio systems from Telesis Electronics fill every room of your home with beautiful sound - from Mozart streaming from your phone into the study, Taylor Swift on the tablet into your daughter's room, or the big game on the patio - all at the same time! Enjoy high-quality sound from discreetly placed speakers that blend seamlessly into your environment. The rich sound from your integrated system will envelop you and add levels of enjoyment to tasks performed within each area - even the laundry room! Humans are by nature visual beings - we need to see things to believe them. Digital television, now available through subscription services such as Netflix or Hulu, allows for High Definition (HD) viewing of virtually any digital content. In addition to providing crystal clear reception, expanded audio, and more channels, digital television allows HD signals to display at resolutions that make content come alive. Telesis Electronics can outfit your home with a complete HD video distribution system that allows you to take advantage of this new technology in every room of your house. 4K HD video makes television amazing again! There's nothing like a night out at the movie theater to unwind and enjoy an escape from everyday life. The problem is - it takes a small fortune for a family to do so, which just adds to the stress you're trying to escape. We have your solution! Our home theater setups can recreate all of the aspects of your favorite cinema (except for the people talking in the next row) like dimmable lighting, tiered seating, and an acoustically treated room. Let Telesis Electronics discuss with you all of the possibilities that exist within your budget and begin the journey that will allow you to escape every night, without even leaving home! 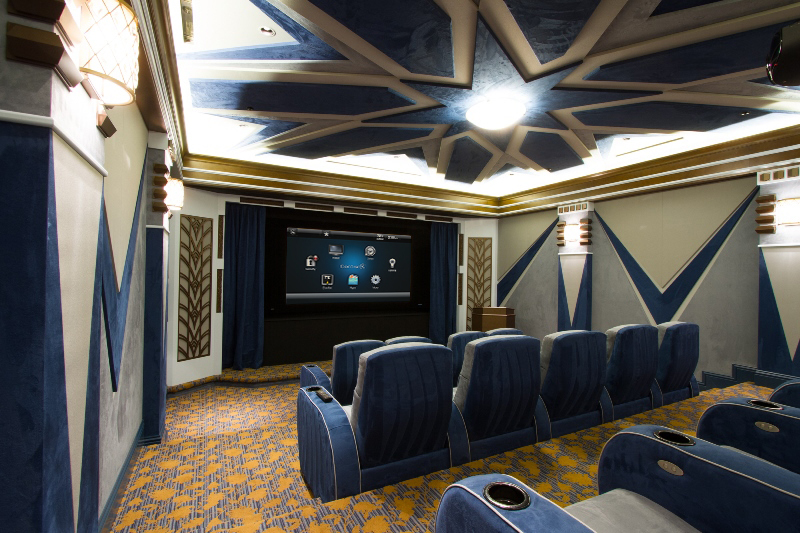 The professionals at Telesis Electronics have been integrating all audio, visual, and even home theater technologies into homes across the South Lyon area since 1985. Our experience is second to none at bringing the full theater experience: significant, sharp, vibrant video coupled with deep, immersive surround audio to living rooms, basements or rec rooms like yours. Contact us today for more information about how Telesis Electronics can design tan amazing home theater system for you. Call us at (248) 486-3720 to schedule a complimentary consultation.